Embarking on a ten day residency in Melbourne was a fast and furious campaign to produce a series of screenprints in the RMIT print studio in a collaboration with Neil Emmerson. I was invited to participate in the Print Imaging Practice Residency as a member of The News Network during July 2016. 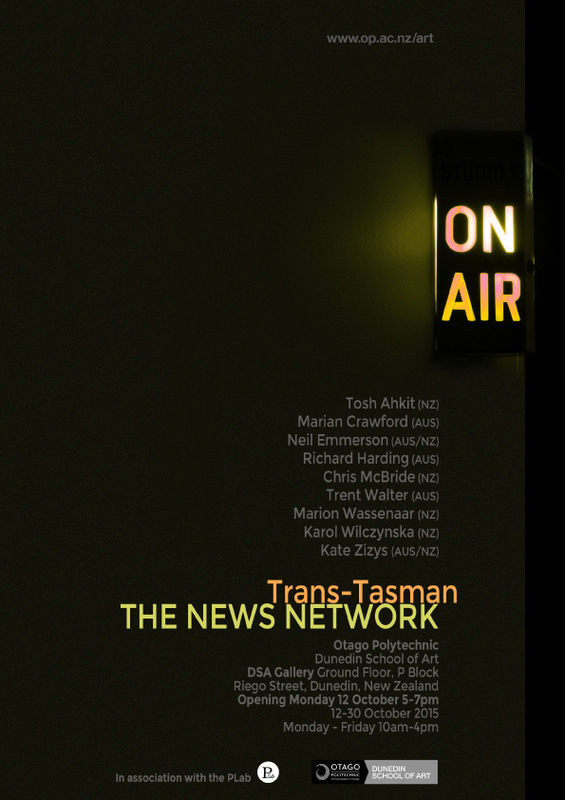 This is a trans-Tasman nine member collaborative visual arts community, established in response to the spectre of Global Media. The RMIT Lightscape exhibition, BROADCAST, taking place during the residency proclaims a mixture of political and personal positions through images from the news and current affairs. I was fortunate to have Neil’s local knowledge to guide me through the busy city. Trams moved us around with ease provided you delay morning departure until after 9am. The Real Australians Say Welcome street poster campaign by artist Peter Drew certainly drew my attention to immigration and the rich cultural diversity Melbourne has to offer. My brief sojourn did allow me to savor the delights of the Victoria Markets, see firsthand the Lightscape installation in the outdoor lightboxes and roam the dynamic array of galleries and shops in Fitzroy. All too soon my inspiring stay was over, but I will be back there again in the near future I hope. Oh, and the prints from the residency are a work in progress with results to follow soon! This entry was posted in 2016 and tagged Collaboration, Exhibition, Residency on August 10, 2016 by marionwassenaar. A network of trans-Tasman artists have come together on a residency in association with the Plab to hold an exhibition of printmedia and fine art prints related to politics and current events at the Dunedin School of Art. This entry was posted in 2015 and tagged Exhibition, Paper, Print, Residency on October 10, 2015 by marionwassenaar.